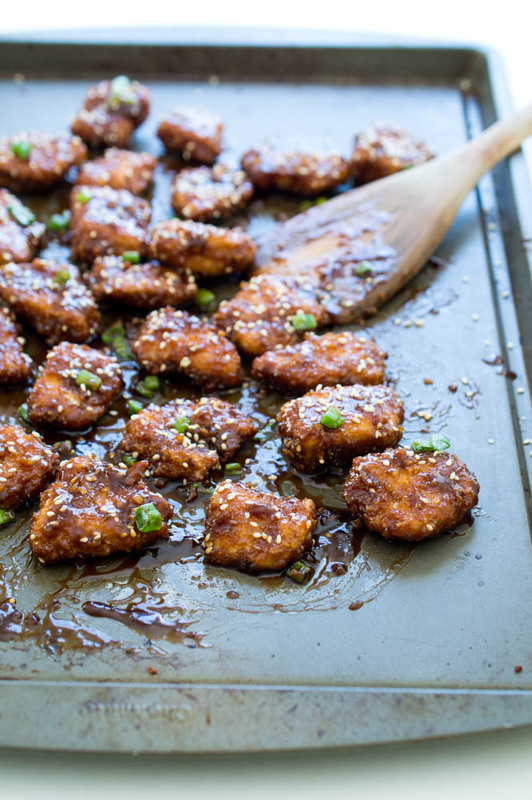 Super Sticky Asian Chicken Bites. Sticky, sweet and dripping with sauce! Serve as an appetizer or with rice to make it a meal. I love making take out dishes at home. They taste so much better and are a lot healthier. In fact these chicken bites are baked not fried saving tons of calories right off the bat. The chicken is first breaded in panko breadcrumbs, then baked in the oven until crispy. When they come out of the oven they are tossed in our sweet and sticky Asian inspired sauce. 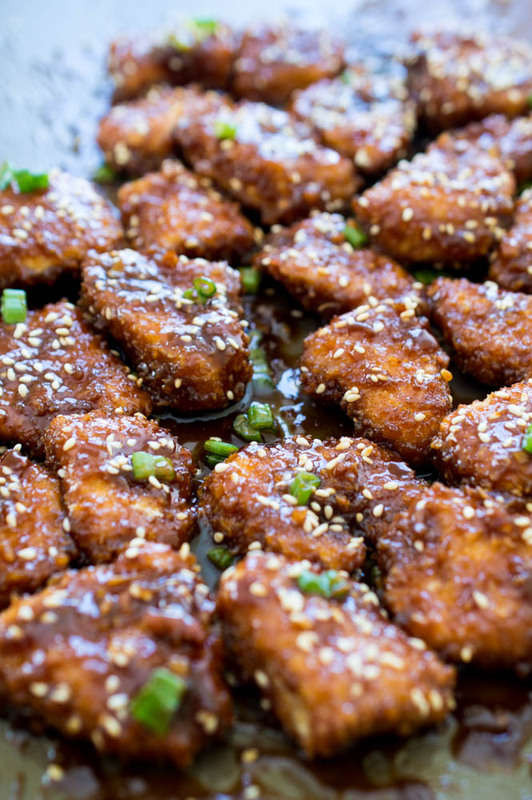 These chicken bites take less than 30 minutes to make. 15 minutes of prep and 15 minutes of cooking. Pretty easy huh? Instead of purchasing homemade hoisin sauce I made my own. Adding peanut butter, soy sauce and honey to the base of this sauce. The honey makes this sauce sticky and finger-licking good. I like to cook my sauce in one large pot and toss the chicken directly into the sauce after they come out of the oven. The Asian Style Sauce is sweet with a hint of spice and coats the chicken perfectly. Crispy and sticky on the outside and tender on the inside. 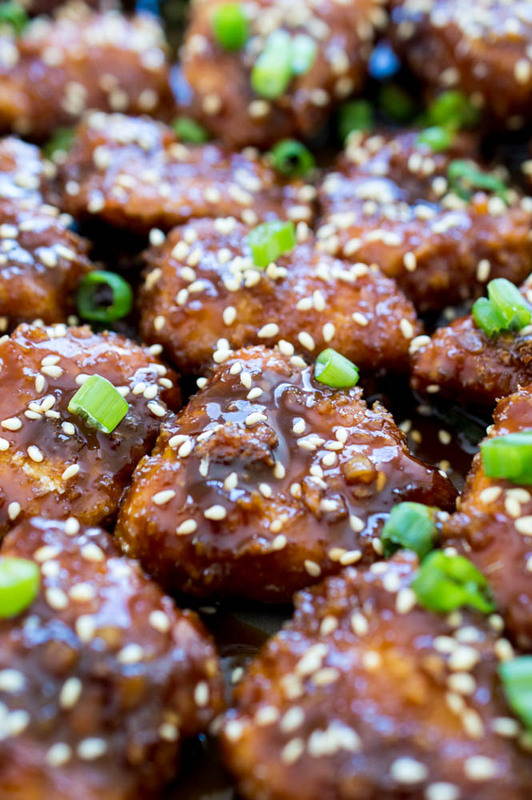 Top the chicken bites with green onions and extra sesame seeds. The chicken is extra crunchy thanks to the panko breading. A simple 3 step breading made of flour, egg and panko breadcrumbs. Make sure to use both hands when breading the chicken. One hand for wet ingredients and one hand for dry. This helps from getting the dreaded breading hands. Once breaded I place the chicken on a baking sheet with a silicon baking mat and place in the oven for 15 minutes. Start by breading your chicken. Begin with flour, egg and then panko breadcrumbs. Line chicken onto a baking sheet lined with a silicon baking mat. Place in the oven and bake for 15 minutes until fully cooked and lightly brown on the outside. 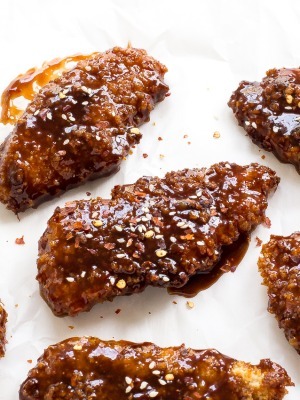 Take chicken out of the oven and toss with the Sticky Asian Sauce. 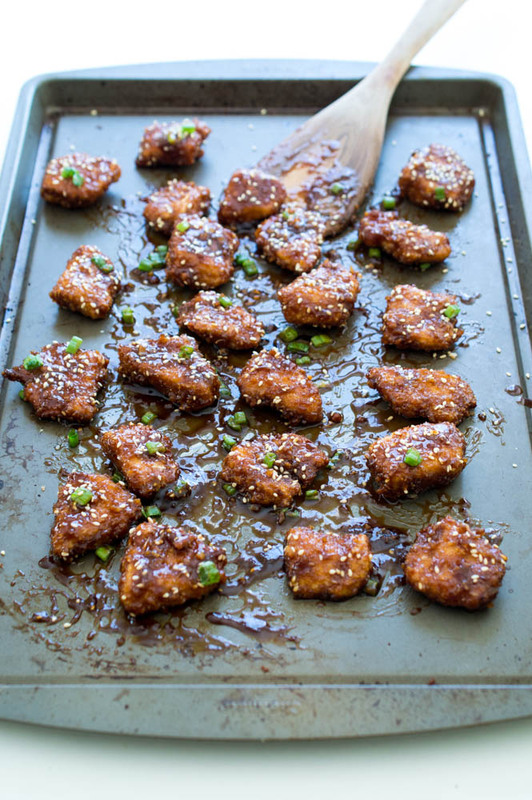 Serve immediately and garnish with extra sesame seeds and green onions if desired. Add in honey and peanut butter and whisk until creamy and bubbly, 1-2 minutes. Whisk in soy sauce, sriracha, sesame oil and sesame seeds. Simmer for 2-3 minutes until thickened. Set aside until ready to toss with chicken. Hi! I made the sriracha chicken a while back and it was a huge hit! I tripled the sauce. I tried the super sticky Asian bites tonight and It was waaaaay too salty! No one could finish it! The sriracha only called for 3 Tbs soy sauce but this one called for a half cup! I tripled it as well and it used the entire bottle! Was the soy sauce in the recipe a mistake? I’m so glad you liked the sriracha chicken. I am so sorry you did not have success with this recipe. 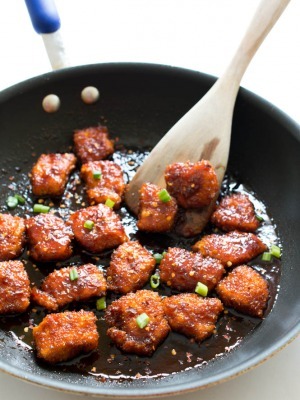 I use low sodium soy sauce in this recipe. To me it makes a huge difference. Did you use low sodium soy sauce or regular? I only had regular Soy Sauce, so I increased the honey and Sriracha in the recipe. I can tell you my house smells amazing, and my husband just walked in the door to eat. 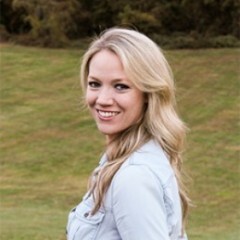 It’s going to be amazing!! Thanks for sharing the recipe! Thanks Jacqui! Hope you and your Husband enjoy! I wish I would have read the comments first. I love salt. I salt food before I taste it. I never use low sodium soy sauce. I wish I would have. It was too salty for anyone to finish but me and I had trouble. I loved the crunch and the stickiness but wow was it way too salty. I’ll try low sodium next time! I can’t wait to try this. Thank you! Chicken itself came out great. I used regular soy sauce and it was way too salty. Tossed out sauce and wound up dipping chicken in bbq sauce. Follow recipe with low sodium and it will probably be fine. It is pretty messed up when people like Becky make a recipe based on not following the recipe. Then say if I had followed the recipe it probably would have turned out better. Modified it for gluten free and loved it thanks! I used low sodium soy sauce (LaChoy Lite) and it was still way too salty. Maybe another brand? I’m sorry it was so salty. I typically use Kikkomam for soy sauce, and I’m not sure the sodium level of the LaChoy. However, you can replace a Tablespoon or 2 with water to cut down on the saltiness. Thank you so much for trying out the recipe and for the comment!